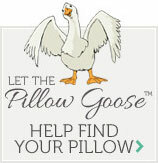 Looking for the perfect pillow can be difficult with so many options out there to choose from. One of the first steps is deciding whether your want a feather and down pillow or if you'd rather go for polyester. The differences may be overwhelming, but luckily for you, Cloud Nine Comforts ® has come up with the perfect solution by combining the best of both worlds. With this unique design, Cloud Nine Comforts ® Feather Cloud ™ pillows combine both feather/down to provide softness and comfort, with premium polyester to lend support and durability. This design is perfect if you are searching for a pillow in a medium firmness that's as comfortable as it is supportive. The blend of feathers and polyester clusters creates the perfect balance to provide night after night of relaxing, restorative sleep.